I think this is one of my favorite projects. I was so excited to get started on it for the nursery. It started out, like most things, with Pinterest. I found this light and thought it was really neat. Of course, my DIY wheels immediately started turning, because this little beauty will set you back several hundred dollars. Do you ever run across DIY projects gone terribly wrong at the thrift store? I've been known to donate a few myself, but it appears this is what we have here. The person who did this must have really loved the color red. I think they took a can of red spraypaint and just went to town. The light bulb was red too. A little strange, but I saw the potential and snatched it up for $5. It included the light kit too, bonus. I ripped off the fabric portion of the lamp shade until I was left with just the frame for both the top and bottom. Then, I picked up this hardware cloth at Lowe's for $10. It took a while for the guy at Lowe's to understand what I was looking for, "Um...it's that stuff that keeps rabbits out of the garden? 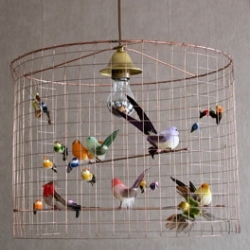 I'm making a birdcage light out of it?" Finally he figured out what I was talking about ;) I have plenty left over for other projects too. I cut the hardware cloth to size, letting it overlap just a little, using some heavy duty wire cutters. I would highly recommend wearing gloves for this step. Let's just say I did not and it was not pretty. Once I had it all wired together and secure, I spraypainted the whole thing gold. Then I gathered some birds from the dollar store, Hobby Lobby, and save on crafts. The inspiration light had wire rods for the perches but I went the more rustic route and used some branches from our backyard. I like the extra texture it gives too. 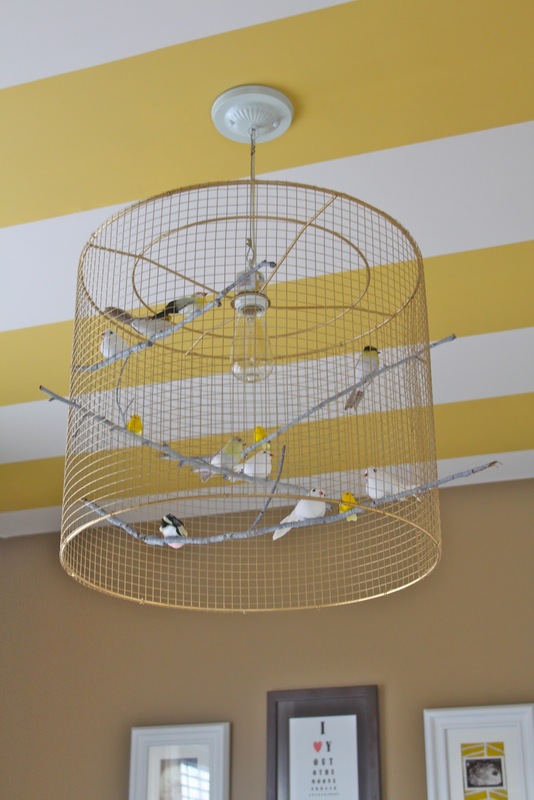 I hot glued the birds to the branches and placed them through the holes of the hardware cloth. They are just resting there in case I ever want to rearrange them. 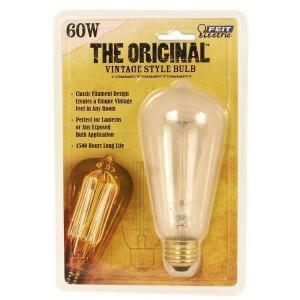 Since the bulb was going to be exposed, I opted for an old fashioned filament bulb from Lowe's like this one. Awesome! I have had this project on my 'to do' list for ages. I love how your light turned out! Funny, I have everything to do this project sitting in my garage just waiting for me to get around to it! 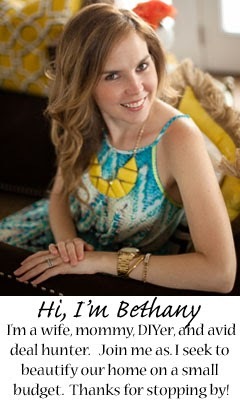 I love how yours turned out & the colors you chose, it's way cuter than the inspiration pic! This is just toooo cute! Loves it. so impressed with your DIY brain and making it come to life !! Super cute! Great idea and fun find to complete it from the thrift store! adorable!! and I like your version better!! So cute! 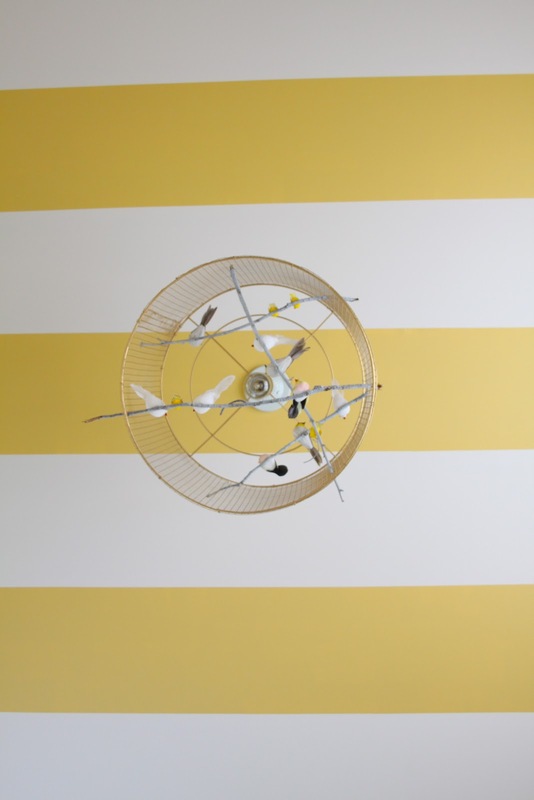 Love the stripes on the ceiling too! Wonderful! I bet it looks great when the light is on too- neat shadows! You did an amazing job. Love it, a great Pinterest lamp jam. I follow your blog, but not until the last year or so - so I just found this project from your "Favorite 5" share on Dimples and Tangles. I just wanted to say that I love it! I can totally see why it's one of your favorite - so adorable and unique! That last picture of the little bird family chilling out in there just kills me. Too cute. Thanks so much Kiri! It was a fun project!